Active Braille from the side connectedConnected via USB to a PC, Active Braille is immediately ready to use for you. 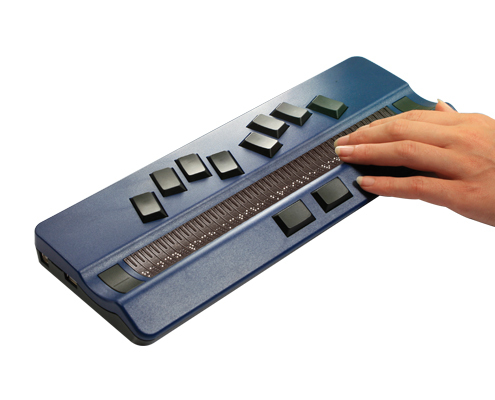 With the use of HID technology (Human Interface Device), Handy Tech sets new standards for Braille displays. 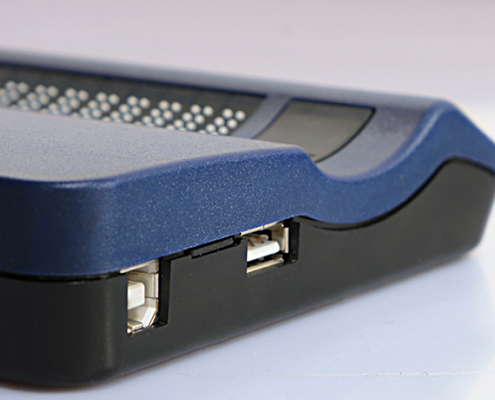 Active Braille also offers a wireless Bluetooth connection ready to use for PC and mobile phones. 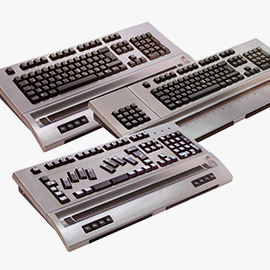 The ergonomically positioned Braille keyboard allows entering text directly with the Active Braille. By using the universal driver of Handy Tech, Active Braille is supported by all major screen readers. 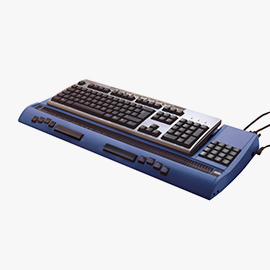 Whether you are using Window-Eyes, HAL/Supernova or JAWS as your screen reader under Windows, Active Braille is the right choice for you. Active Braille is also ideal to use with Apple computers, even iPhones or iPads. Connected wireless via Bluetooth, Active Braille provides complete access. 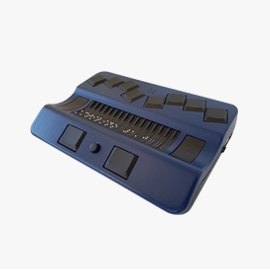 Insert Micro SD card into the Active BrailleActive Braille has complete note taker functions like editor, calculator, clock and much more. Hundreds of books can be stored on the 4 GB Micro SD card. When transferring notes with the Handy Tech software HTCom to a PC, grade two can be directly converted into normal text. Active Braille is packed with innovation. 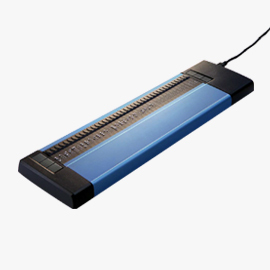 The HID technology allows using Active Braille without the need of installing a software driver. 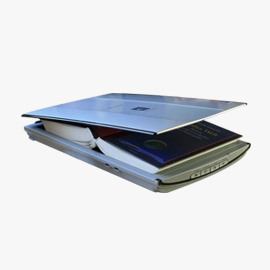 The patented ATC technology detects the reading position on the Braille display and with the Micro SD card, you can easily store and transfer files. 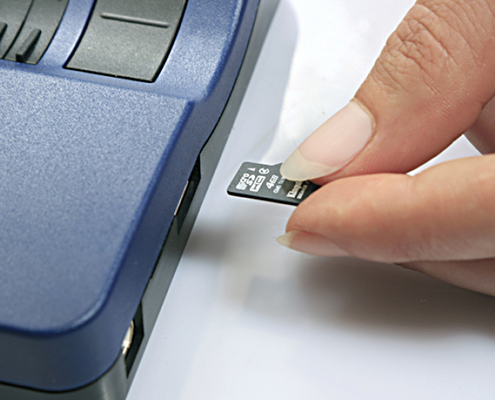 Active Braille allows also setting the firmness of the pins of the Braille display. 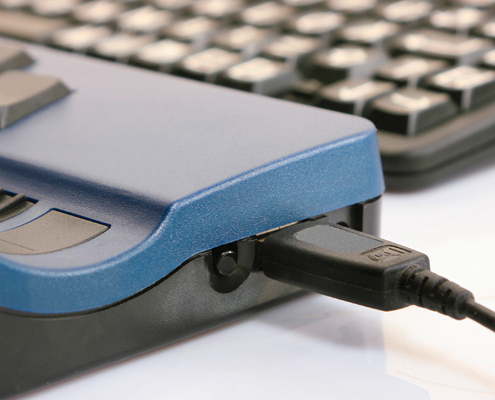 By providing two USB connections, you can for example also connect a standard keyboard to Active Braille.Active Braille from the side. Thanks to the Bookworm mode, Active Braille is ideal for reading books. With its unique ability to detect the tactile reading position, the Bookworm mode allows to automatically scroll the text shown on the Braille display after it was completely read. So if you, for example, read a book like “Gone with the Wind” with about 600 000 characters, until now, on an ordinary Braille display you had to push the advance button about 20 000 times for reading the book completely. Active Braille automatically switches to the next section of the text after the text was read completely on the Braille display. With Active Braille, annoying key presses for advancing the Braille display are no longer needed. You can enjoy the reading undisturbed. 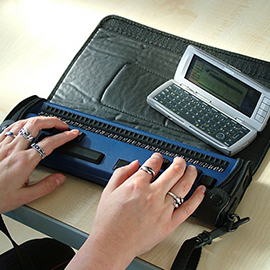 Active Braille comes with a handy carrying case, just open it and you can start taking notes with Active Braille. 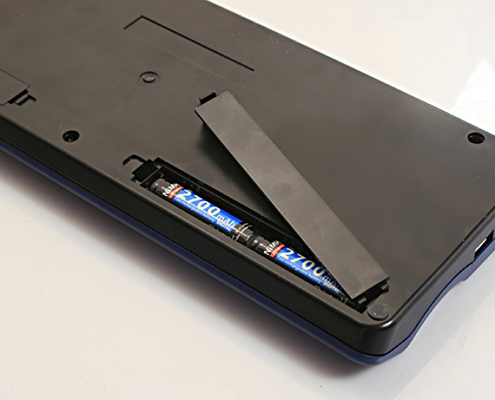 Your notes can be easily transferred to a PC where you can modify and print them. 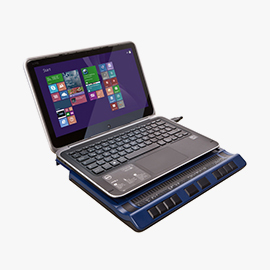 Besides the automatic scrolling when reading text, the ATC technology of Active Braille opens up new possibilities for you using a PC. Assistance functions make information accessible or faster to access. ATC assistance can for example read the whole line of text or words for you if you have touched the first letter. ATC can also announce the changes of text attributes at the reading position. So it is indicated to you that for example normal text has turned into bold text. 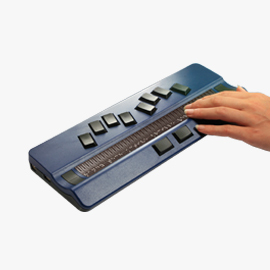 The reading position can be observed by a sighted person in real time at the Braille monitor. ATC also allows to safe the reading position in a log file. The reading behavior can be analyzed with the software tool ATC-LogAnalyzer. The numbers of characters or words per minute is analyzed as well as the reading speed of each single letter and the reading flow. Screen information shown in separate windows can be displayed in separate areas, in so-called Braille frames on the Active Braille. ATC opens new possibilities by detecting the reading position. Now you have parallel access to different applications. According to the reading position, the corresponding window is selected. Helpful scripts like the task master based on ATC makes PC using even more comfortable for you. Only the Handy Tech Braille cells are sloping backwards and are concavely shaped. The reading area is ideally shaped for the reading finger. When reading on the Active Braille, the Braille characters can be touched in a natural relaxed hand position.